COMPREHENSIVE – This dual-sided 360° swivel design luxury mirror features 1x7x magnification. 1x for a great view of your entire face all at once, and 7x for precision, because every detail counts (7” diameter). 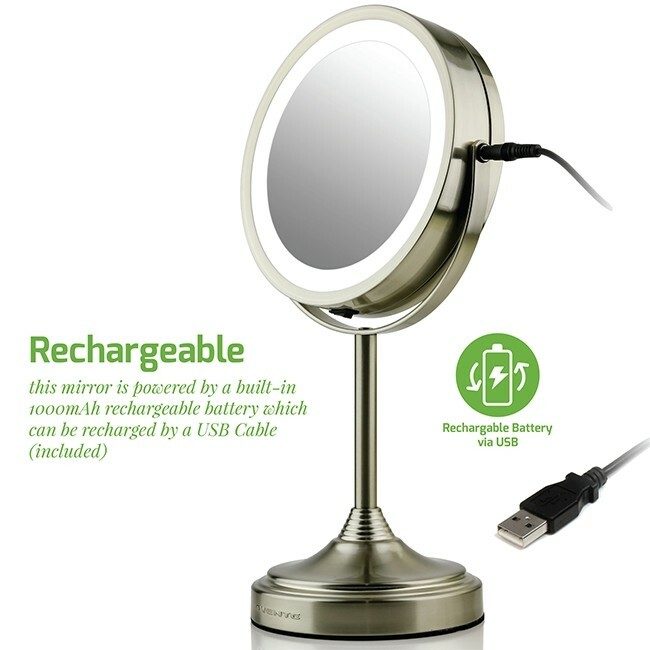 RECHARGEABLE & CORDLESS – This mirror is powered by a built-in 1000mAh rechargeable battery which can be recharged by a USB Cable (included). This is perfect for those who don’t want to spend extra cash on batteries every time they need to be replaced. COOL-TONE LED LIGHTS – Last longer and use less electricity than all other types of lighting, helping you save money. You also will never need to replace the light bulb, it will last for the lifetime of the mirror. SLEEK, MODERN, STYLISH – Creates a luxurious focal point while brightening and opening up small spaces. It’s also lightweight, and conveniently portable, so no matter where you take it, you’ll have a clean & cord-free vanity space. DISTORTION FREE – Look about 4 in. 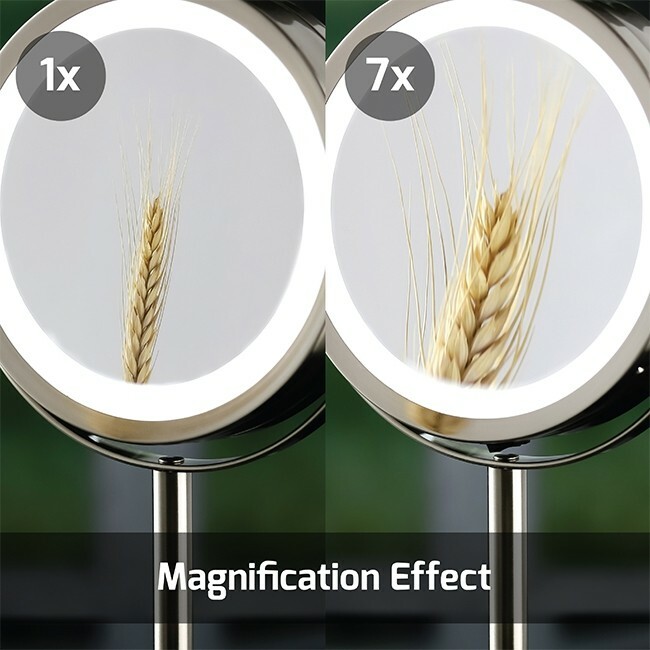 away from the 7x magnification mirror for a distortion-free view. This works best for putting makeup on (eyeliner, mascara) and grooming eyebrows. 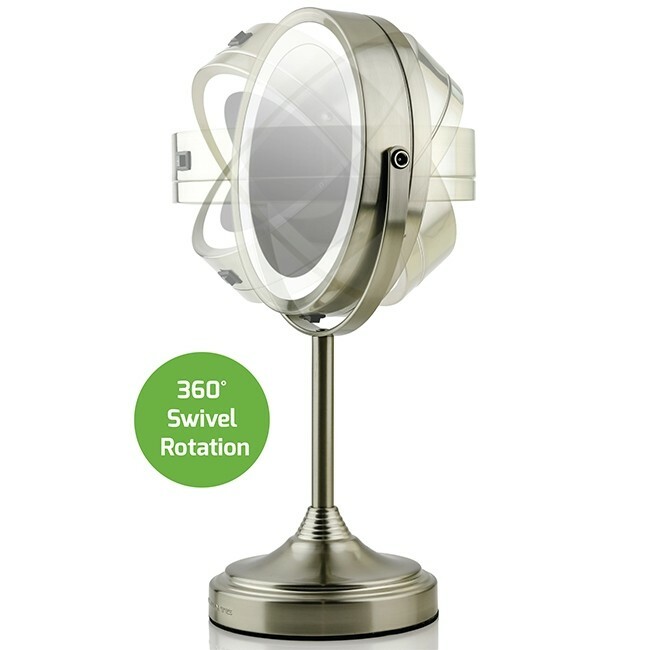 Ovente mirrors are built with a diffused ring light that eliminates shadow while in use as well as unique 360° internal wiring that allows safe rotation to any angle. It allows you to view yourself most accurately through its 7” viewing space, precise 1x7x magnification, and its LED lighting is the closest you can get to natural lighting. 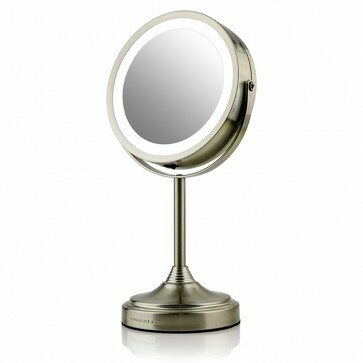 With your Ovente makeup mirror, you can be confident in how you look, anywhere you go, at any time of the day. 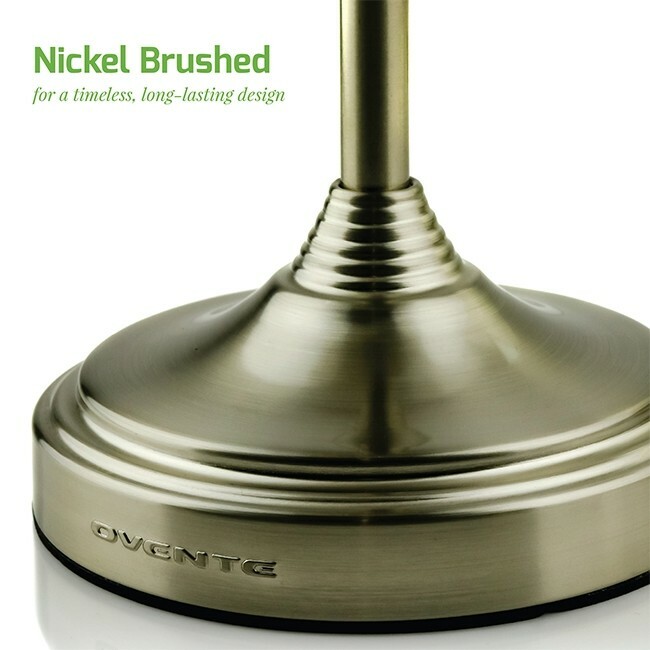 At Ovente, we believe its important to reduce your carbon footprint, so we use LED lights in many of our products. LED lighting is not only beneficial because of its natural lighting, it’s also a popular option because it saves you money from energy bills while also reducing waste. They contain no toxins or mercury, and you no longer need to worry about replacing light bulbs, since LED lights last many years and thousands of hours—even when used all day long! 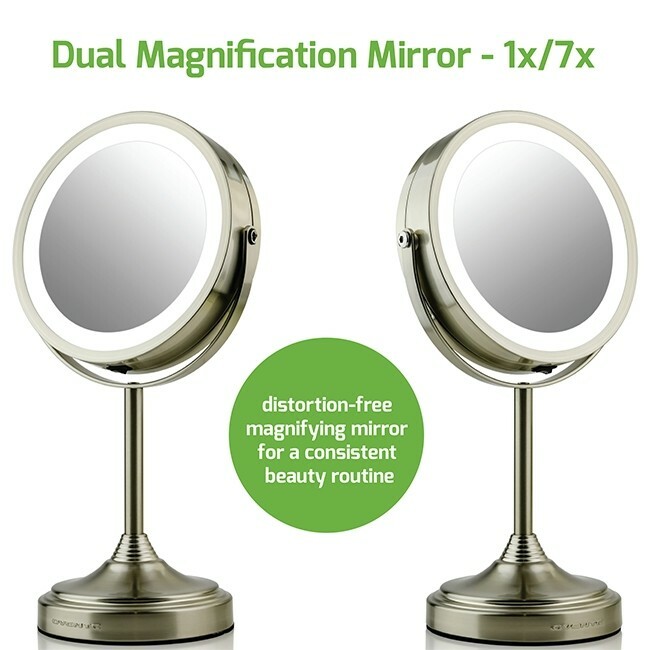 This mirror is equipped with Cool-Tone LED Lights for a clearer and brighter visual color while enabling you view every pore, wrinkle, blemish, and hair as clearly as possible. 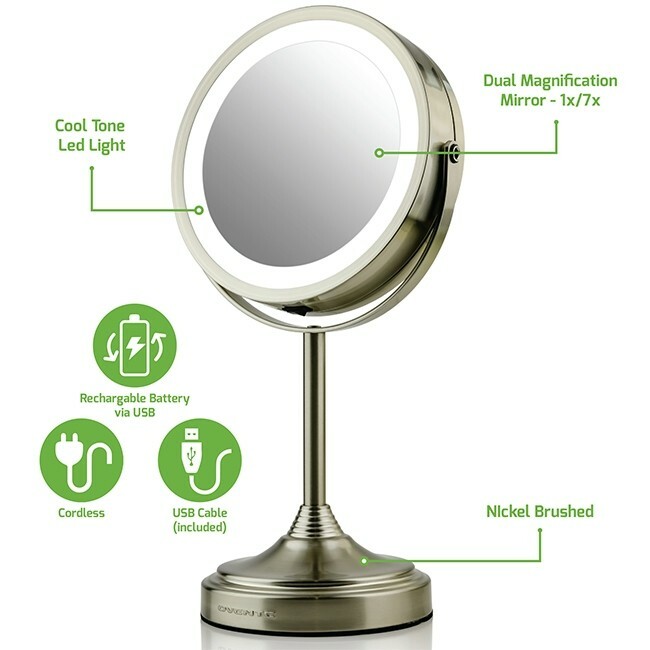 This mirror is powered by a built-in 1000mAh rechargeable battery which can be recharged by the included USB cable, saving you money on batteries! 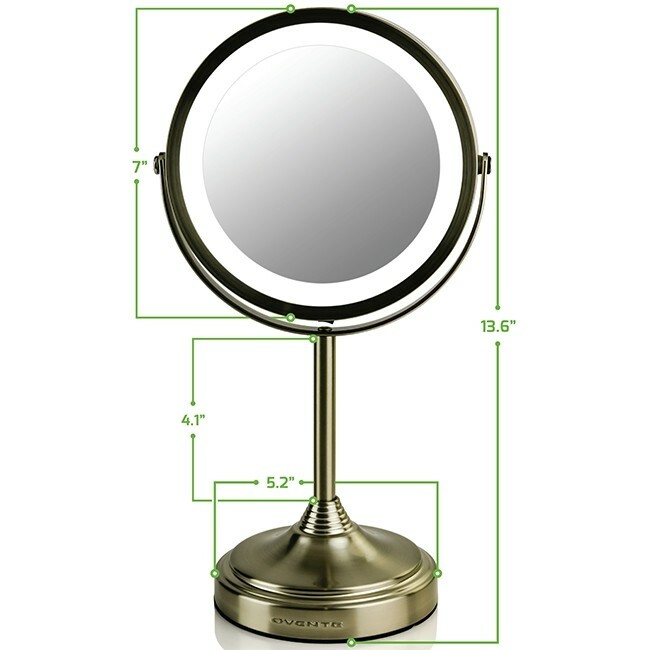 This mirror also flatters and enhances any room, creating a feeling of light and space. For Feng Shui enthusiasts, it aids in the flow of energy and brings a sense of calm all throughout the room.